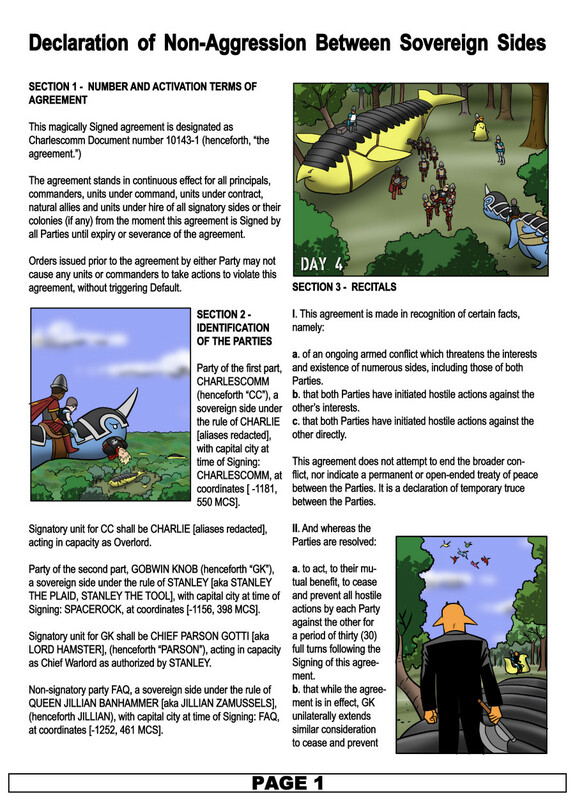 The agreement stands in continuous effect for all principals, commanders, units under command, units under contract, natural allies and units under hire of all signatory sides or their colonies (if any) from the moment this agreement is Signed by all Parties until expiry or severance of the agreement. 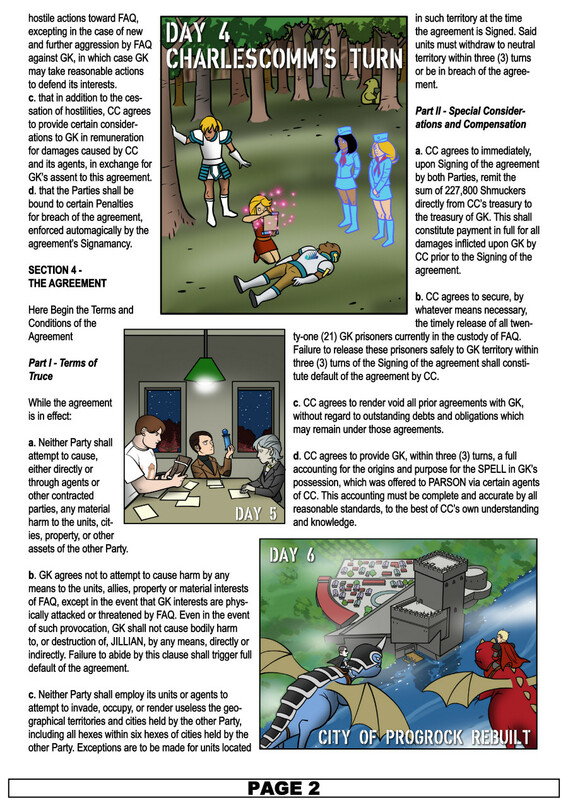 Orders issued prior to the agreement by either Party may not cause any units or commanders to take actions to violate this agreement, without triggering Default. Party of the first part, CHARLESCOMM (henceforth "CC"), a sovereign side under the rule of CHARLIE [aliases redacted], with capital city at time of Signing: CHARLESCOMM, at coordinates [ -1181, 550 MCS]. Signatory unit for CC shall be CHARLIE [aliases redacted], acting in capacity as Overlord. Party of the second part, GOBWIN KNOB (henceforth "GK"), a sovereign side under the rule of STANLEY [aka STANLEY THE PLAID, STANLEY THE TOOL], with capital city at time of Signing: SPACEROCK, at coordinates [-1156, 398 MCS]. Signatory unit for GK shall be CHIEF PARSON GOTTI [aka LORD HAMSTER], (henceforth "PARSON"), acting in capacity as Chief Warlord as authorized by STANLEY. Non-signatory party FAQ, a sovereign side under the rule of QUEEN JILLIAN BANHAMMER [aka JILLIAN ZAMUSSELS], (henceforth JILLIAN), with capital city at time of Signing: FAQ, at coordinates [-1252, 461 MCS]. a. of an ongoing armed conflict which threatens the interests and existence of numerous sides, including those of both Parties. b. that both Parties have initiated hostile actions against the other's interests. c. that both Parties have initiated hostile actions against the other directly. This agreement does not attempt to end the broader conflict, nor indicate a permanent or open-ended treaty of peace between the Parties. It is a declaration of temporary truce between the Parties. a. to act, to their mutual benefit, to cease and prevent all hostile actions by each Party against the other for a period of thirty (30) full turns following the Signing of this agreement. This page was last edited on 8 November 2014, at 02:53.